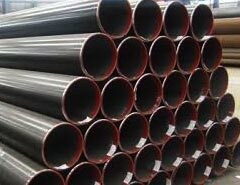 Avail from us the Carbon Steel Pipes in wide variety. Carbon Steel Pipes, offered by us, are available in various dimensions to meet the demands of the clients. The Carbon Steel Pipes are designed & developed by the experts by utilizing well-tested methods. We have firmly positioned ourselves as one of the preeminent Carbon Steel Pipes Manufacturers and Suppliers in India. The entire range of the Carbon Steel Pipes is manufactured in adherence with international quality standards. Stringent quality-tests are carried out to ensure that only defect-free Steel Pipes reach the buyers. We hold the expertise of delivering bulk orders of the Steel Pipes within the allocated time. SAW/EFsW : ASTM A671 & A672. Size : 1/8â�� to 26â�� & UPTO 76â�� For Welded.